Running the ball and playing great defense was indeed the name of this playoff game, where JMU started the game with a grinding, precise 6 play, 57 yard drive to go up 7-0 early. From there Colgate QB Grant Breneman and the Colgate offense slowly ground and chipped away at the Dukes’ lead, cutting the deficit to 10-6 and eventually tying the game 13-13 after Breneman tucked the ball and ran 32 yards for a touchdown. The Colgate defense, meanwhile, forced five interceptions, two of which were nabbed by Tyler Castillo. Holl and the defense technically only sacked JMU QB Ben DiNucci once, but did pressure him all afternoon and prevented the Dukes from connecting on many big plays. James Madison’s longest play from scrimmage was a 33 yard run by DiNucci, and they kept their chunks of yardage short. But most of the game James Madison, too, was up to the challenge of containing the Colgate offense. Colgate only averaged 3.1 yards per carry and was stopped, with the Dukes down 20-13, on a crucial 4th and 1 from the JMU 10 to have Colgate turn the ball over on downs. Eventually the JMU offense would turn that into a DiNucci touchdown run to tie the game at 20. JMU had to deal with the distraction of the possibility of Houston leaving for Charlotte in news that broke Wednesday. Charlotte subsequently pulled it offer Friday when Houston said he wanted to also consider other options. He is considered a candidate for the East Carolina job. Cardon Johnson ended his JMU career with 66 yards and a touchdown in his final game as a Duke. 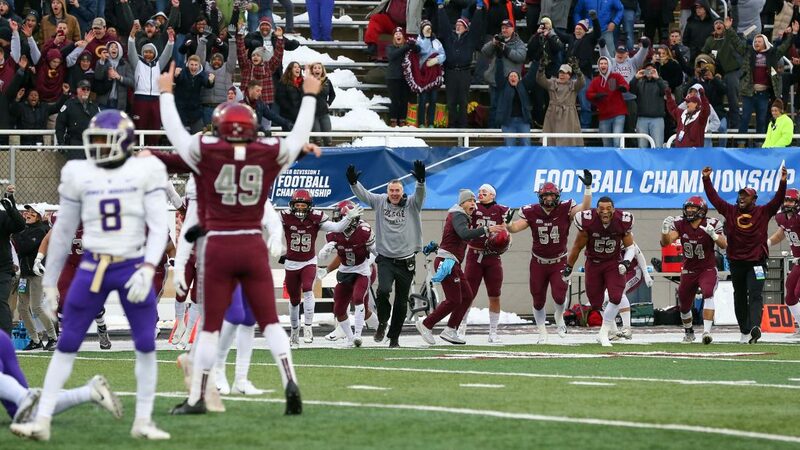 But in a game that would be tight throughout, the final twist seemed to come on a fake punt try that was sniffed out by the Colgate defense with 2:46 left in the game. The failed fake was the first of JMU punter Harry O’Kelly’s career. Then Breneman on offense led Colgate on a 7 play, 40 yard drive to set up the game-winner with seconds left to play. Like they had all game, WR Owen Rockett had a huge reception (he ended the day with 5 catches for 101 yards and a touchdown), and RB James Holland, who was a freshman when Colgate upset James Madision in the 2015 playoffs in Harrisonburg, got some tough yards to make an extremely difficult field goal attempt into a makeable one. It all set up Puzzi’s incredible booming kick as the final seconds ticked off the clock. Colgate survives and advances to next week, where they will take on North Dakota State in the Fargodome. Kickoff is set for noon Eastern time on Saturday, December 8th and will be broadcast on ESPN.